Where Did All Of The Quarterbacks Go? On August 4, 2016, the Kansas City Chiefs signed free agent Nick Foles, a player who has proved that his incredible, Pro Bowl worthy 2013 season was a fluke more than talent. Foles signing came in an off season where the New York Jets tried to play chicken (and lost) with Ryan Fitzpatrick, and saw the much maligned Cleveland Browns sign first-round flame out Robert Griffin the Third to be their starter. In an era where it’s easier than ever to complete a pass in the NFL, we seemingly cannot find 32 competent men who are up to the task. While there has always been bad quarterback play in the NFL, now more than ever seems to highlight the notion that if you don’t like the quarterback you have now, you’re screwed. We used to live in a time where if you didn’t like your quarterback, then you could trade for a team’s back up. The Seattle Seahawks had great success with Matt Hasselbeck who was the back up for the legendary Brett Farve- a man who himself was traded from the Atlanta Falcons. Speaking of the ATL, they not too long ago traded away their back up Matt Schaub to the Houston Texans. Growing up in Chicago, myself and fellow Bears fans used to hold the back-up quarterback in high regard- sometimes higher than the starter. Bears fans used to be so devoid of QB hope that we loved it when 31-year-old Brian Griese came to play in 2006 to be our back-up. Why Are We Ruining National Treasure Christoph Waltz? The opening scene of Quentin Tarantino’s 2009 masterpiece Inglorious Basterds is a thing of beauty. In it, a local French farmer played by Denis Menochet is having a conversation with a high ranking Nazi who we later has earned the nickname “The Jew Hunter”. The conversation and scene clocks in at almost 30 minutes, yet it flies by as the farmer and the Nazi are having such an intense and engaging conversation. The Jew Hunter is charismatic and charming and the life of the scene. While the Farmer always keeps his guards up, the audience get sucked in. Despite his name, he doesn’t seem like he’s that bad. He seems like an everyday bloke just trying to do his job. He could be wrong about his mission, but he needs to investigate anyways. Then the scene turns. Not only does the audience later figure out the Farmer is hiding a family of Jewish people under his floorboards, but The Jew Hunter knows this as well. He gets the Farmer to admit his “crimes” and eventually orders his men to kill the entire family. One of the daughters, Shoshanna, escapes, and The Jew Hunter points his gun at her back and she runs away- carefully following his prey. Then… he gives up. He admits defeat and walks away. 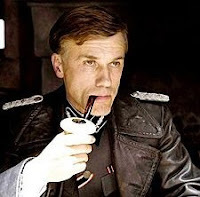 And this is how America was introduced to the great Christoph Waltz.